As men get older their prostate gland often enlarges. This is usually not due to cancer. It is a condition called benign prostatic hyperplasia (BPH). BPH does not usually develop into cancer but an enlarged prostate may sometimes contain areas of cancer cells. In its early stages, prostate cancer generally does not cause any symptoms. Many prostate cancers start in the outer part of the prostate gland, away from the urethra, the tube that carries urine out of the body. If a tumour is not large enough to put pressure on the urethra, you may not notice any effects from it. These are more often a symptom of non cancerous prostate conditions. If you are experiencing any of these symptoms, you should see your GP straight away so that they can examine you. It is most likely a benign (non- cancerous) condition but your GP can tell you for sure. 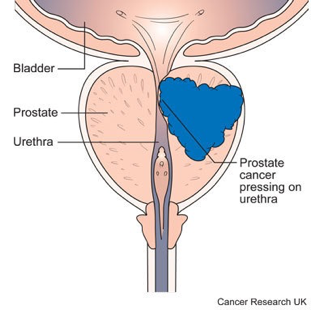 With both prostate cancers and non cancerous enlargement of the prostate, the larger prostate gland presses on the urethra, the tube that carries urine out of the body. The pressure blocks the flow of urine and causes symptoms such as feeling the need to urgently go to the bathroom or having difficulty passing urine. Remember that if you have any symptoms you should be checked by your doctor. But most enlargements of the prostate are benign. That means they are not cancer and can be easily treated. Prostate cancer can grow slowly, especially in older men. Symptoms may be mild and occur over many years. Sometimes the first symptoms are from prostate cancer which has spread to your bones but this is not common. Prostate cancer cells in the bone may cause pain in your back, hips, pelvis or other bony areas. Cancer that has spread to other areas of the body is called metastatic or secondary prostate cancer. Other symptoms that may occur are weight loss, particularly in elderly men, and difficulty getting an erection (where you haven’t had difficulty before). GPs have guidelines that tell them the symptoms to look out for. If your GP thinks that you have the signs or symptoms of prostate cancer, they will refer you for a rapid access prostate assessment. If your PSA level is slightly raised (a borderline result), the guidelines say you should have another PSA test 6 weeks time. The second test checks if the PSA is going up or is staying the same. If you have a suspicious PSA reading and other symptoms that could be related to prostate cancer, the guidelines say your GP should consider referring you to a specialist for an appointment within 4 weeks. Your GP may decide to delay doing a PSA test sometimes. There are a few situations that can affect the reading and make it less accurate – for example, if you have a urinary tract infection (UTI). A test should be delayed for six weeks after you’ve had treatment for a UTI. If your GP wants to delay doing a test, you can ask them to explain why.